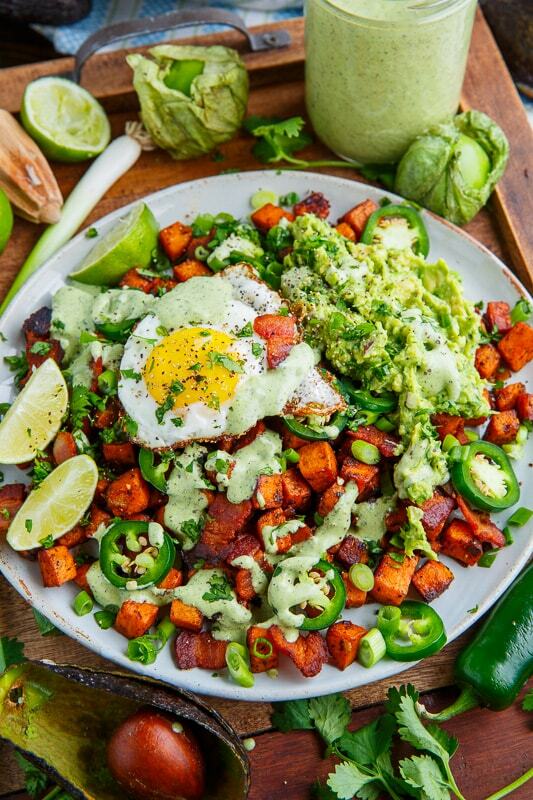 Crispy sweet potato fries with bacon and eggs topped with guacamiole and creamy tomatillo ranch dressing that are perfect for breakfast! I am a big fan of sweet potatoes, especially when used as a substitute for regular potatoes! I often order sweet potato fries in place of regular fries at restaurants and its super easy to pan fry some sweet potatoes in a skillet until crispy at home. Savoury breakfasts draw my attention more that sweet so using some crispy sweet potatoes fries as a base for a tasty breakfast with bacon and eggs is a great way to go. I start out by cooking some bacon (It just wouldn’t be breakfast without bacon!) before frying the sweet potatoes in the bacon grease until crispy. The potatoes are seasoned with onions, garlic, cumin, smoky chipotle chili powder, salt and pepper and topped with some fried eggs with deliciously runny yolks. 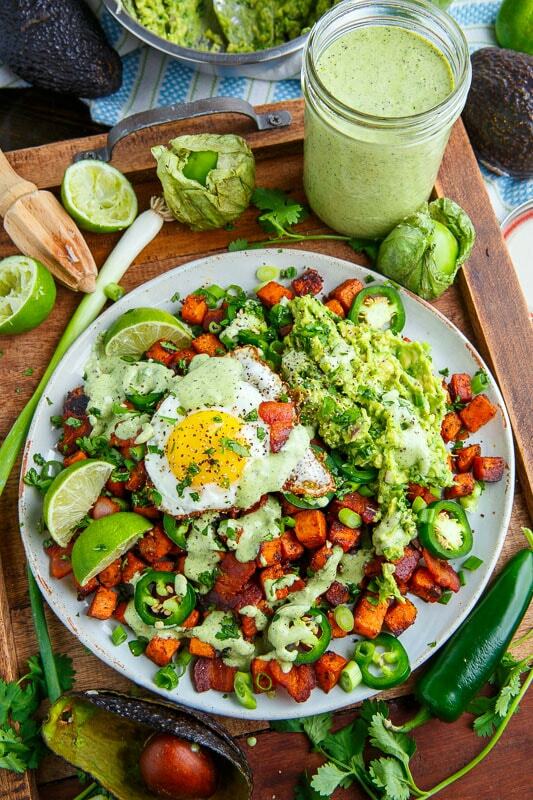 The entire breakfast is then topped off with some fresh ingredients including homemade guacamole a creamy tomatillo ranch dressing dressing, cilantro and jalapenos! This breakfast takes more time to make than say scrambled eggs or pancakes but it’s so worth the effort! Cook the bacon in a skillet and set aside on paper towels to drain, reserving 2 tablespoons grease in the pan. 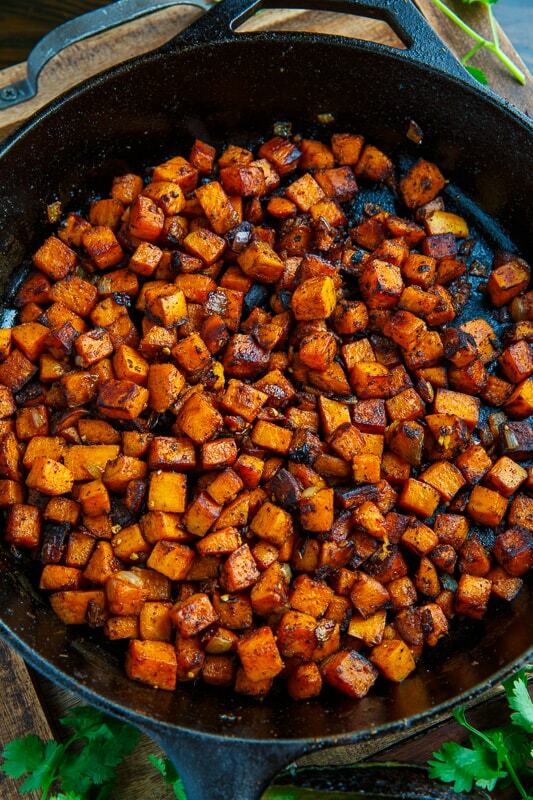 Add the sweet potatoes and onions to the pan and cook until the sweet potatoes are lightly golden brown, about 5-7 minutes, mix and repeat until the sweet potatoes are tender, about 15-20 minutes. Add the garlic, cumin and chili powder and cook until fragrant, about a minute, before dividing the sweet potatoes and bacon between four plates. 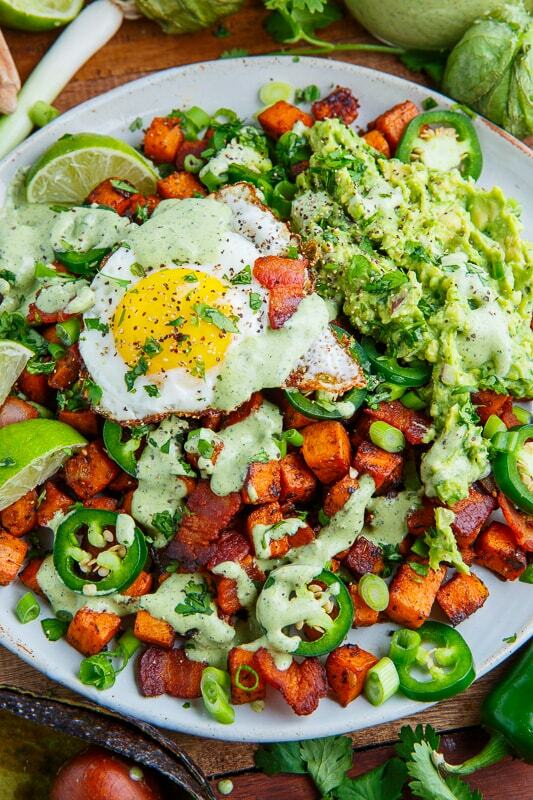 Fry the eggs as desired and place on the sweet potatoes along with the green onions, cilantro, jalapeno, guacamole and dressing. Option: Replcae the creamy tomatillo ranch dressing with guacamole buttermilk dressing or creamy avocado salsa verde dressing or cilantro lime vinaigrette! Where's the recipe for the dressing? Could you nestle the eggs in the potatoes and cook them in the oven? I’m all about the one pot meals! Made it just as described using the creamy tomatillo dressing and it was delicious! The whole family loved it.